Going Tuscany: yes, well done, but what to see? Tuscany is so full of medieval and renessaince art not to mention the amazing landscape the hills offers to the astonished gazes of the visitors. A little piece of advice? Start with the Val d’Orcia in the Southern part of Siena: the light fin the paintings of the 400 and 500’s is coming from this place, a real paradise on earth to discover through a lovely joblly trip! The beauty that comes from some movies like “The English Patient” or “La vita è bella” comes from here! Rich architecture is the main charatheristic of Pienza and Montalcino with its fortresses, and worthy to visit are also the abbey of Sant’Antimo, the monastery of Sant’Anna in Camprena,the medioeval baths of Bagno Vignoni. Going along you are going to meet the fascinating Radicofani and Rocca d’Orcia, and the ‘grancia’ of Spedaletto. Along beautiful and gentle hill, Val d’Orcia landscape are original and various, like the reserve “Lucciola Bella”, the famous white pines in Castiglione d’Orcia, and the pawerful calanques (calanchi), meaning the clay streets surrounded with cypresses and white streets which runs amongst farms, agriturismi and antique monasteries. 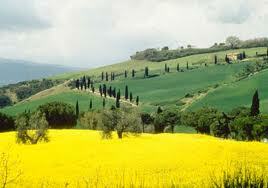 Val d’orcia’s landscape is the expression of an ancient nature. Five communities (Castiglione d’Orcia, Montalcino, Pienza, Radicofani and San Quirico d’Orcia) are created the Cultural, Artistic and Nature Park. The best things to eat? Simply yet incredible flavour in Val d’Orcia. The best and recommended choices are pecorino cheese, wine, oil, honey and saffron. The viticultural tradition in the region around Siena dates back to the Etruscan times: 2500 years of grapes on hills with their characteristic wavy and soft shapes. Sangiovese, a native and famous variety of wine, and other fab varieties such as Canaiolo, Tuscan Trebbiano, Malvasia or Bianca lunga, Vernaccia and Ansonica. But the king here is Chianti, one of the first wines to be appreciated in America! In Val d’Orcia you have to drink Moscadello di Montalcino and the Rosso di Montalcino: unforgotable!!! This entry was posted on Wednesday, August 1st, 2012 at 11:05 pm	and is filed under Discover Italy. You can follow any responses to this entry through the RSS 2.0 feed. You can leave a response, or trackback from your own site.